Wait a Minute – Are We Trading? They say you can’t do business with friends – or family. They say things like: “business is business,” or “that’s business.” But that explanation really doesn’t satisfy me. It hints at fostering a degree of enmity with the people with whom we do business. It’s like we save our love, friendship, and affection for when office hours are over. However, there are also times when we throw down money on the barrelhead, and it’s completely unwarranted. This can end up being an insult to the other party. I find myself having to carefully structure the relationships I’m going into. I want to prepare myself whenever I get talking to someone about a new project/venture. One of the best incubators for this has been the relationships that we often find when playing in bands. 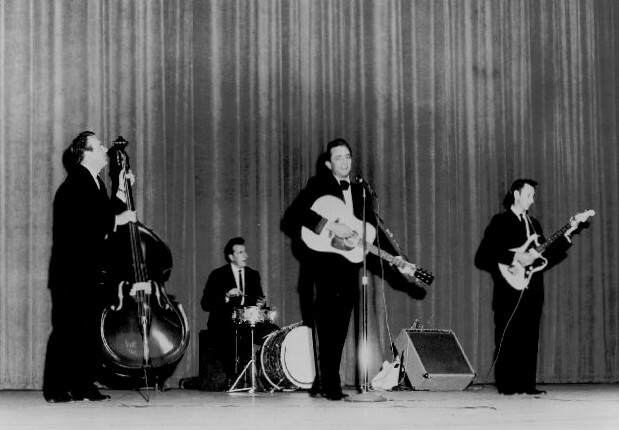 Johnny Cash dressed himself and his buddies up in black, and miraculously launched an epic career. But one of my favorite bands couldn’t even get a drummer to go on tour with them, ending up in a mid-90s descent into obscurity. How do some band relationships work and others don’t? I haven’t played in any official “band” for more than five years now. I remember finally going into the studio a while ago, for the first time in a decade, to record a new track. Now, I could lay down the guitars and vocals and whatnot, but I needed a drummer. And how did I get one? I hired one. I traded money for his time and talent. It was a good trade. Yes, we are friends, and his name is on the credits of my release, but our relationship is motivated by trade over partnership. And that’s not at all a bad thing – except when it is. I have a friend who is a talented illustrator. He uses his art to communicate cross-culturally. One day he needed my help, as he was about to donate a painting to the municipality of a local town. He needed a letter drafted to accompany one of his pieces, in a language that I spoke and he didn’t. He got right to it – he emailed me with suggested rates and deadlines for my translation work. I received his email at the end of my work day, and I was about to hang out with my family. The job he was offering was too small for me to charge him my regular translation rate, and I really wanted to see that letter get done. So I didn’t let him trade with me, I didn’t really opt for a partnership either, instead, I decided to translate the letter as a gift. Because that was how I saw our relationship. He was somebody I wanted to give to (he has given me so much in the past, it was really a no-brainer for me). When we know the core motivations of our relationships – trade, partnership, or gift – we are much more at peace in pursuing them. We get more clear of the boundaries of each one, and know when and how to communicate those boundaries. A good reference that I use when reviewing relationships is to see business as a trade, community as a partnership, and art as giving. This, for example has led me to make art more generously than in the past. Take a moment to examine your relationships today – are you trading, partnering, or giving? Nice piece, Adam. It made me think about some relationships that haven’t worked out for me. Welcome to #my500!